Wisdom teeth are the last adult teeth to come into the mouth (erupt). Most people have four wisdom teeth at the back of the mouth -- two on the top, two on the bottom. While most licensed dentists recognize the signs that indicate that wisdom teeth removal procedure is necessary, it's not uncommon for wisdom teeth to become impacted prior to extraction. Impacted wisdom teeth are third molars at the back of the mouth that don't have enough room to emerge or develop normally, and if you haven't had yours removed, it helps to be aware of the signs that are indicative of impaction. Here are the main signs that you may have wisdom teeth that are impacted and ready to be extracted. If you're experiencing chronic pain, inflammation, and/or swelling in your gums, your wisdom teeth may be ready to come out. This is occurring as a result of the increased pressure that your wisdom teeth put on your gums as they grow in. Visit a licensed dentist to address the issue. 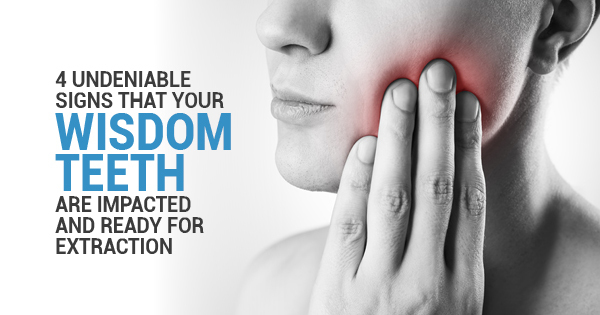 Bad breath occurs for many reasons, but your wisdom teeth are definitely a culprit. This is particularly important to take note of if you're experiencing any of the other symptoms on this list. If bad breath is your only symptom, you may just need to start taking better care of your teeth. It may seem surprising, but sometimes impacted wisdom teeth cause irritation that results in a fever. This is your body reacting to the threat of infection, so visit a dentist as soon as possible. If you're starting to have trouble opening or closing your mouth, chewing, or any other jaw-related stress, it could be your wisdom teeth telling you they need to come out. If the pain continues to get worse, it's almost definitely your wisdom teeth that are causing the problem. Visit a dentist immediately for a checkup. Ultimately, wisdom teeth removal is an outpatient procedure performed on 5 million Americans each year. Knowing these signs can help you be aware of your dental health issues and address them promptly. For more information about licensed dentists, contact Dental Arts. I felt more at ease coming to Dental Arts. This was my second visit. And I will always be coming back here for all my dental needs.